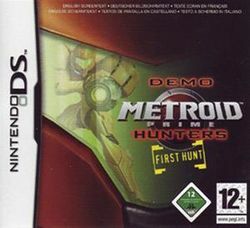 Metroid Prime Hunters: First Hunt is a game demo that was released along with the first few batches of the Nintendo DS. It was a preview of what the Nintendo DS could offer, while at the same time being a preview for the upcoming game: Metroid Prime Hunters. This demo features a very short single-player level to play through, along with a training area for brushing up on your skills in Morph Ball mode. In addition, you'll find a few multiplayer maps that can be played deathmatch style with others who own a copy of the game. This page was last edited on 24 April 2010, at 03:39.